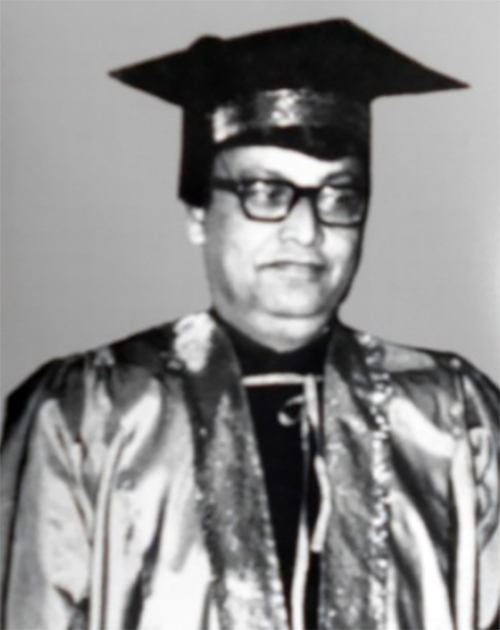 Dr. Satya Ranjan Baroova (1919-2004) was the founder Vice-Chancellor of Assam Agricultural University, Jorhat. Dr. Baroova, a graduate from Allahabad Agricultural Institute, obtained his Master’s degree in Agriculture from Banaras Hindu University in 1942 and Ph.D. from University of California in 1947.This distinguished agricultural scientists and administrator started his professional career as a teacher in Allahabad Agricultural Institute in 1942. Dr. Baroova also served as Economic Botanist, Special Officer (Food Production); Additional Director (Agriculture); Deputy Director (Community Development Programme); Director (Fishery) and Director (Agriculture), Govt. of Assam. He visited many countries and keenly studied the structure, facilities, course curricula, evaluation and grading systems, administration and integrated teaching , research and extension programmes of several agricultural universities of America, Canada, Europe, Japan and other Asian countries under a fellowship programme of the Rockefeller Foundation. As Director, Dept. of Extension (GOI) and Joint Commissioner of Commercial Crops (GOI), he rendered valuable services for development of those sectors. Besides, Dr. Baroova served as Commissioner, India; Director (R&D), Motilal Pesticides (India) Pvt. Ltd. and Consultant, Asian Development Bank in Bangladesh. Dr. Baroova, a recipient of the National Extension Fellowship of Indian Society of Extension Education was actively associated with formation of the Field Management Committees of Assam as the Working President. Dr. Baroova joined AAU as the Founder Vice-Chancellor in 19th March 1969. His contribution towards establishing the University at Jorhat initially with two constituent Colleges e.g. College of Agriculture (Jorhat) and College of Veterinary Science (Khanapara) was remarkable. Under his leadership, the University started the trimester system of education (later on transformed to semester system), and obtained financial aids from USAID, IDA Project of the World Bank and Rockefeller Foundation for its initial development phase. Both Dr. Baroova and his wife Mrs. P. P. Baroova also initiated the base work for establishing a Faculty of Home Science (Presently Faculty of Community Science) under the University. This great academician and administrator left for heavenly abode on March 9, 2004.